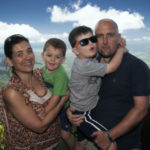 I’m a science educator, a Brit from London living in Queensland, Australia, with my wife and 2 sons. Dad taught me about WW2. He was 13 at the start of the war in Europe and made it into the Merchant Navy in ’43. My uncle Artie was on HMS Ark Royal for the hunting of The Bismarck and when she was torpedoed herself in ’41. Both outlasted the war. I built models with my dad in the mid-70s and early 80s. I finally made it back to the hobby in 2016. My 5-year-old has just built his first model – a Red Arrows Hawk. The cycle continues! The RAF is 100 Years Old Today! Gentlemen, Start your Engines!